West Indies defeated England in the opening World T20 match by 6 wickets. After winning the toss and putting England to bat, who set 183 runs competitive target. 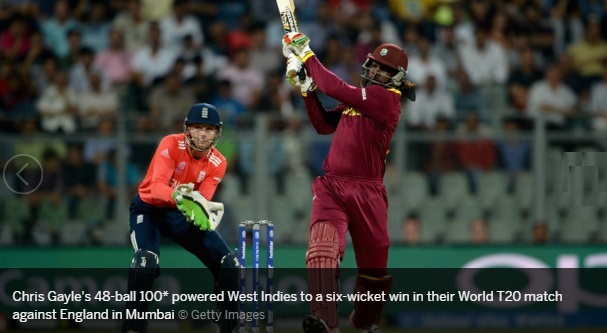 Chris Gayle’s unbeaten 100 of just 47 balls guided West Indies to rather easy win. Chris Gayle brought his “A Game” to World Twenty20 as West Indies brushed England aside in what was a very exciting game on Wednesday night. Windies won the toss and elected to field first on a pretty good batting track. England put up a good total of 182 with all top order contributing in the cause. West Indies however chased down the target with rather ease thanks to Chris Gayle absolute superb inning. Joe Root (48) and Jos Buttler (30) guided England to a decent total of 182 but was not enough to win the game for England. Alex Hale and Jason Roy had given England a decent start of 37 runs for the first which, Joe Root and Jos Buttler upped the tempo for England in the middle overs with quick-fire 48 and 30 respectively guiding England to a impressive 182 which was pretty defend-able on this pitch was was sure to give some assistant to seamers under lights. But Chris Gayle had other ideas as he put England bowlers to sword and mainly negotiated with Six and fours. He scored his second Twenty20 international century of just 40 balls which included massive 11 sixes and 5 fours. Marlon Samuels also played his part with 37 of 27 balls but it was Gayle who single handedly won the game for West Indies. Chris Gayle completed his second Twenty20 international hundred which included 11 towering sixes as West Indies brushed England aside in their opening group game. Chris Gayle finished as man of the match for his 100 of just 47 balls as West Indies start their world t20 campaign with a impressive. England face South Africa on 18th March while West Indies set to take on Sri Lanka on Sunday, 20th march. Chris Gayle has no supassed New Zealand’s McCullum with most sixes in Twenty20 internationals. Gayle’s 11 sixes aganst England take his total career T20 sixes to 93 followed by McCullum who has 91. Shane Watson, Warner and Afridi has 79, 73 and 70 respectively. England looked controlled in their batting approach but it was their bowling letting them down in what was a very winable game. Take away Chris Gayle’s 100 and result of West Indies batting is not world class and England will feel disappointed having let the game slip of their hands. Andre Russel (2), Dwayne Bravo (2) and Badree (1) were among the wicket takers to keep England in check after their decent start. Chasing 182 Chris Gayle’s incredible 100 was the difference between two sides.